Keer takes great pride in taking part in the preservation of some of the world's most important lighthouses. Until the latter half of the 20th century most lighthouses were originally fitted with Fresnel lenses. Some of these jewels of the sea are constructed from hundreds of glass prisms. Each prism requires high precision to send a beam of light over miles of ocean. Since 2003 Keer has restored numerous belt-lens and prism geometries for the unique Makapu’u hyper-radial light (Oahu, Hawaii), the Diamond Head light (Honolulu, Hawaii), and the Ponce de Leon Inlet light (Ponce Inlet, Florida). Over the years a classification system for designating the size of Fresnel lighthouse lenses was implemented. (1st order being the largest and 8th order the smallest.) In the late 1800s two larger sizes were added. The largest being the hyper-radial lens. Out of the almost twenty thousand lighthouses ever built only 31 hyper-radial lenses were ever made. Today the whereabouts of only 22 are known and there are only 12 left functioning in lighthouse towers to protect mariners today. Of these the Makapu'u Point light is the largest configuration of any hyper-radial light. In 1968 it was damaged by gunfire. Two of the belt lenses were destroyed by the impact. In 2008 The US Coast Guard decided to restore the Makapu'u Point light and the Diamond Head light in Honolulu Hawaii. In total there were 13 lens components that needed to be replaced. 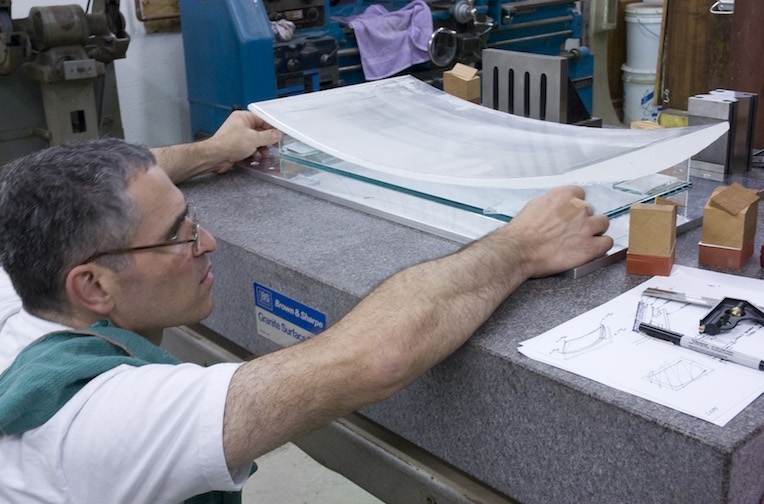 Keer Glass was contracted to undertake the reproduction of the glass. Lighthouse lenses are made predominantly of radial glass prisms however some have "belt" shaped glass components as well. The belt lenses that we machined for the Makapu'u Point light are the largest lens components of any lighthouse ever made. Though the geometry is not particularly complex, the required scale and precision for the two curved Makapu'u belt-lenses presented a considerable challenge. We needed to design and produce custom molds, fixtures, and tooling throughout the multi-stepped process. The first step was to make a clay model of the lens. From this an investment mold was made and glass was cast. Next custom diamond tools were created for milling. After machining the lenses were lapped. Finally the lenses were hand polished. Prior to taking on this project we did a lot of research on traditional lighthouse prism manufacturing methods. This included traveling to England to visit a museum which had one of the original machines for producing lighthouse glass. 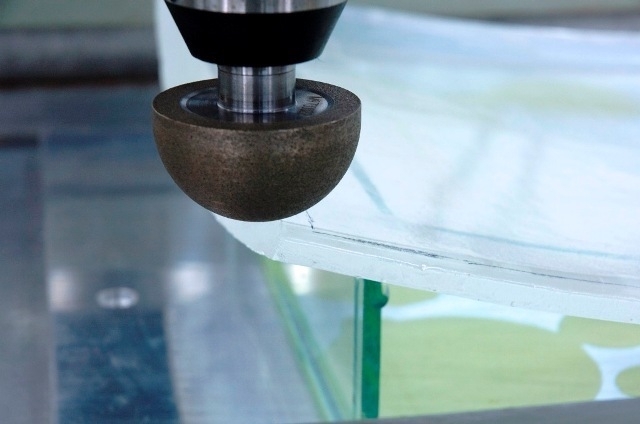 While we gained a lot of valuable technical information, in the end we choose the more contemporary technology of CNC machining with diamond tools which is a highly efficient way to create precise glass components. To start, virtual models of the desired lens geometry were generated on the computer. Next glass blanks were cast and mounted on the CNC mill. After machining, further surface refinement was acheived by lapping the lenses with glass laps. To do this we built a semi-automated programmable lapping station capable of adjusting to the various geometries we needed to produce. For the final step we polished the lapped surfaces by hand with cerium oxide and water on a felt wheel. Lapped and polished lens (surface "A") awaiting reorientation for finishing sides "B" and "C"